My brother’s friend spotted the dog in the park. Shivering, starving, skin pocked with flea bites. “Someone needs to take this dog home,” the guy said, and my brother — perhaps even surprising himself — got an idea. My brother and I never had a dog growing up. Our family rented a modest home, and the previous tenants had a labrador that clawed up the hard woods, so the landlord was kind but firm on this point: No dogs. My mom even called one night, using her nicest voice because, you see, her kids were begging for a dog, maybe please this one time. No dogs. Josh and I got a cat, an aloof creature who spent most of her time outside. We got a hamster, and when that hamster died, we got two more hamsters. But we never had a dog. Because of that, I’ve always been a tad awkward with dogs, the way I imagine college students might be around babies. They’re cute, and I know everyone likes them, but what exactly do I DO with them? Back in the park, Josh scooped up the scrawny little guy in a cardboard box. This is the part where Josh is supposed to play hero by taking the dog back to his own house, except that isn’t what happened. Josh had only recently moved back to Dallas from London, and at thirty years old, he wasn’t sure how long he’d stay, or what job he’d be doing next month, so he took the creature to the two people whose stability he trusted far more: My parents. My parents had moved from that old rental house shortly after I graduated high school, and now resided in a lovely orange-brick house across town that belonged only to them. They were out that afternoon, but Josh placed the dog in the back yard, and left a note taped to the door. “Careful — guest outside.” Beside those words, he drew a dog. Pretty much any etiquette book ever written will tell you that you should not give someone else a pet. Never, ever give a pet. So it was technically a huge mistake that Josh gave my parents that dog, and yet, like a lot of things in life, the story took on a glint of divine justice. Because for the next sixteen years, my parents cared for that dog in a way few people could have managed. He was a badly damaged dog, after all, who would never outrun the shadow of whatever violence he’d experienced before my brother found him. He behaved as badly traumatized dogs do: He barked, he bit, he whimpered. Even a vet, who had seen no small share of challenging dogs, once said to me, “I don’t know how your parents do it,” but they did it, because they’re those kinds of people. And also, because they were an old couple inching toward retirement without any grandchildren, not even a whisper, not even a hint. There was a big empty spot where the next generation should be, and the dog curled up and took a nap in it. They named him Gus. My mother had been reading a book on Sweden, and so they actually named him Gustavus Adolphus, King of Sweden, but we called him Gus. I was living out of the country when Gus arrived at the house, a fluke of timing that would shape our relationship, because he always treated me as an interloper. He growled when I came to the door. He snapped at me a few times when I tried to pet him. Meanwhile, he loved my brother beyond beyond. He twirled in circles when Josh arrived, stood on his paws and danced. It activated all my sibling rivalry: Josh, always Josh. My parents did not really love my brother more, of course. But Gus did. 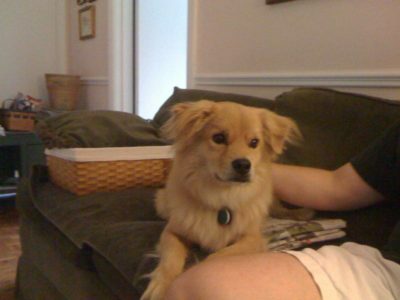 “He’s a good dog,” Josh would say, stroking his silky blond hair. “For you,” I would say. It was my childhood all over again. Playing military games is fun … for you. Taking standardized tests is easy … for you. Stuffing me in a closet is hilarious … for you. But having a highly sensitive dog in that house changed my interaction with the place. For years I’d been accustomed to coming and going whenever and however I pleased, but now, I stood at the front door as I heard my parents scurrying around inside so they could yoke the dog before I entered: “Do you have Gus? Where’s Gus?” Once, I was peckish in the middle of the afternoon, and I pulled out a hunk of brie from the refrigerator when my mother took it from my hands. “That’s Gus’ brie!” she cried. The dog was handsome, I will give him that. Golden hair, big brown eyes, and an enormous swishing tail that looked like pampas grass. “Oh you’re dog is so cute,” people would say, and my parents would swiftly have to intervene before anyone tried to pet him. My parents tried their best. He wore a muzzle for a while. He went to obedience school, and I’m pretty sure he failed. But nothing they could do could change his fundamental mistrust of strangers. He was loving to my parents, over the moon about my brother. It was just dumb luck that he saw me as I often saw myself. As an outsider. I bribed him with bacon. I fed him cheddar. Like any dog, his principles only took him so far. Peanut butter, pork fat, chicken grease: He would be putty in your hands. After a few years, he had learned to tolerate me, and by ten or twelve years, he was something close to happy upon my approach. I never felt closer to him than in the last three years of his life, when the fear and hyper-vigilance was replaced a contented lack of awareness, maybe a touch of dementia. He was sweet then, and I would sit on the hardwood floor with him, stroking his velvety golden fur. “You’re a good dog,” I told him, and kissed his nose. My parents were out of the town when the dog bottomed out. The vet clinic that was boarding him called Josh and me, and we drove up to find him: Barely breathing, eyes blank, luxurious golden fur shaved and skin scarred up with bed sores. Josh carried him on a pillow and put him in the passenger seat of his truck, and they drove to the park where he had once found him, all those years ago. Josh bought Jack in the Box, a final meal, and they sat on a picnic blanket, and Josh ate some fries while Gus mostly lapped at his water. Even fast food wasn’t fun anymore. He was ready to go. I joined them afterward at the clinic, and we sat on the cold tile floor on either side of him, saying our goodbyes. He was so tiny now. He must have looked a lot like he did when Josh found him, and yet a decade and a half had passed. I had moved away and come back. Josh had stayed, and built a whole career for himself here. There had been romances and meltdowns and career highs and professional crises, and the dog — to my own surprise — became a part of the family. It was tough to let him go. “He’s a good dog,” Josh said, stroking his fur.